Mark your calendars so that you can get a taste of Black liberation and meet all of those working to build institutions and resources to make it a full-time reality. Due to the nature of the session, I will refrain from sharing too many details on this session. What I will say is that at its conclusion, many women were in tears and deeply moved. It was extremely therapeutic and many women wanted to continue the session pass it's end time. Cultural values...communalism, collective identity, kinship ties and interconnectedness. The Purpose of this Session: This world was created to crush you, so we have to figure out how to stand up under that weight. Haqq: How do we tell the story of who we are in affirming ways. Are people problem saturated? Can you ask for a unique outcome? Suffering as a Purification? Test from God? Would the Creator create me and design me in this way only to experience continual suffering? Dr. Mona Masood’s - The Curious Case of Colorblindness: How to talk about race with our NonBlack children. Children are a Blank Slate. They’re too young to talk about race. Children recognize race and categorize by race and gender by 6 months old. They develop racial bias by 3-4 years old. Beliefs don’t always have to reflect their parents views. Categorizing by race can be a normal psychological development. Categorize multiple dimensions at once. Assume people are alike in one dimension, they are alike in all. Society is the biggest teachers. Internationalization based on images from society. She also shared the origins of the song Eeny, Meeny, Miny Moe and how it has extremely racist origins. Doctor Mona was uncomfortable after hearing Black Muslims speak about their horrible experiences from the Muslim community. She realized that she may have inadvertently played a role with her silence/reluctance to discuss the issue. She’s now doing the work to change this problem through educating non-Black Muslims. Don’t say we’re all one ummah because this erases the experiences of Black Muslims in the United States. Racism is not an individual sickness, it’s perpetuated by society. It’s not the past. She also shared that people are taught slavery was a bad thing and Civil Rights Movements fixed it. This thinking reinforces that everyone who displays racism has an individual problem. 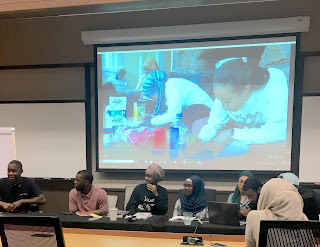 DREL fellows discussed what their expectations were going in to the fellowship and the obstacles they individually and communally had to overcome including anxiety and being comfortable in silence. Yaseen, also shared that, growing up he did’t feel like he had an identity because he was raised overseas. He said that one of the questions on DREL’s application he could not answer, “What do you think about the state of current Black Affairs?” Due to him not growing up in the states, it led him to knowing he was Black on the outside but struggling with his Blackness on the inside. As a result, he knew nothing of the state of current Black Affairs. So the fellowship was an affirmation and gave him the platform to be able to step forward into this leadership role, while others, who were already on the forefront of these issues were able to step back and relax. Another fellow shared that this was the first collective that he was involved with that wasn’t majority Black Americans. So it expanded his view of what the African Diaspora meant. He stressed that we are not just a monolithic block, though there are similarities in our communities. Towards the end of this session, another DREL fellow and Spelman alum, Zainabu, shared something extremely profound, “When we separate our identities based on social constructs we deny ourselves a complete and radical liberation.” Zainabu feels that DREL helped her to see Blackness outside of oppression but in a liberatory lens. If you’re interested in becoming a DREL fellow and you meet the requirements below, please head over to www.muslimwellness.com and find out more information! Our political and social realities have been difficult to process. But you are not alone. In moments like these, self-awareness and critical self-reflection are invaluable. They are especially important for our future leaders and thinkers. Therefore in this political moment young adults especially must acquire new skills related to racial trauma and healing, emotional intelligence, compassionate leadership and community organizing. 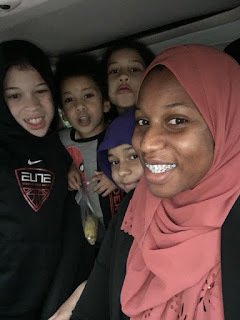 We invite you to submit an application for Muslim Wellness Foundation's Deeply Rooted Emerging Leaders [DREL] Fellowship program and Intensive Leadership Retreat - Black Muslim Youth Rising. The DREL Fellowship centers the challenges, strengths and well-being of Black Muslim Emerging adults (18-25 years old) and is grounded in the belief that building power and sustainable grassroots movements cannot occur without healing and introspection. 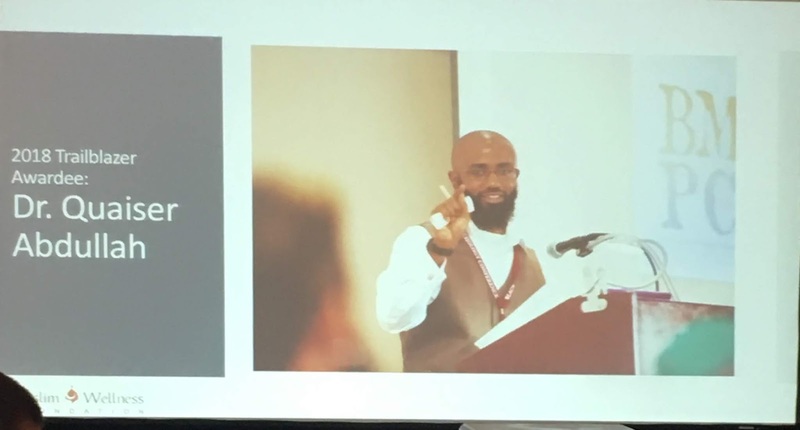 We hope to nurture a cohort of emotionally intelligent social justice activists and leaders who will more assertively and constructively engage in spiritually grounded, justice oriented advocacy within the Muslim community. The Black Muslim Youth Rising Intensive Leadership Retreat (October 27-29, 2017 | Philadelphia, PA) is one component of the Fellowship. Organizers, artists, and scholars will lead workshops designed to usher our Fellows on a journey of self-awareness and leadership building through experiential learning and team building exercises. On the first day of the retreat, attendees will participate in group activities designed to establishing trust, cohesion and healthy group dynamics. It will also focus on guided discussions on the psychological impact of oppression, trauma of racism, Islamophobia. The second day of the retreat will focus on emotionally intelligent leadership, including self-awareness, self-regulation, social awareness, networking and relationship building; consciousness of context, self and of others. The final day of the retreat will seek to integrate each fellows understanding of self and leadership capacity with strategies for community engagement and advocacy. Join us for a weekend of self-reflection, affirmation and community building! *Must be available to attend the Black Muslim Youth Rising Intensive Leadership Retreat Friday October 27 - Sunday October 29, 2017 in Philadelphia, PA. Cost of lodging and meals for each Fellow will be covered by Muslim Wellness Foundation. Welp, that’s all for BMPC 2018! I will add that there’s so much value in this conference and it’s so sad that so many of us within Philly missed it yet I sat across the table at lunch from two women who came all the way from Canada. 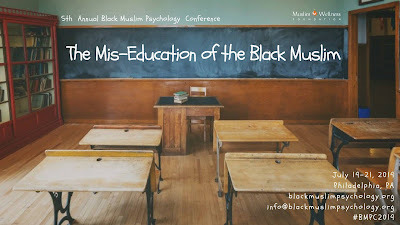 Please don’t think of this as a conference ONLY for intellectual Black Muslims. It’s for all of us at whatever level we are on and I have to say, it’s been so redemptive and healing for me to attend every year. I hope to see all of you there next year and if you can’t attend, at least donate so that this organization can continue the liberatory work that’s inherent in the creation of this conference.